Zoomtopia is just 3 weeks away! We’ve packed the two-day event with educational breakout sessions featuring cutting-edge information and advice from industry professionals, networking opportunities, inspiring fireside chats from global thought leaders Jeff Weiner and Stephen Covey, and an awesome after-party. In addition to the main events, Zoom’s Happy Crew is hard at work preparing to surprise and delight you. We can’t tell you everything, but here are five fun things you can expect at Zoomtopia this year. Social Cove – Create a Zoomtopia themed 180-degree video and instantly share to social media. Provide your Zoom reviews on Trustradius and G2 Crowd to earn a gift card. Take a selfie, get a team photo, and recharge your tech. Zoom Store – If there’s one thing a Zoomie loves, it’s swag! We’ve got tee-shirts and other fun items to choose from. Expert Sandbar – Zoomtopia is your chance to network with your fellow Zoom users, but it’s also the perfect occasion to talk to us. Visit our sandbar to ask us anything – no question is too small. Prizes – The Zoom Happy Crew will be out in full force delivering happiness to Zoomtopia attendees. Keep a lookout for opportunities to win fun prizes like sports memorabilia. Industry Pins – These nifty pins allow you to self identify by your industry or function (Healthcare, Education, Technology, Marketing) and find alike colleagues to network efficiently. We even have blank pins if you don’t see your industry represented. These fun surprises are just the tip of the iceberg. There’s a lot more to Zoomtopia that we’re keeping secret to surprise you. 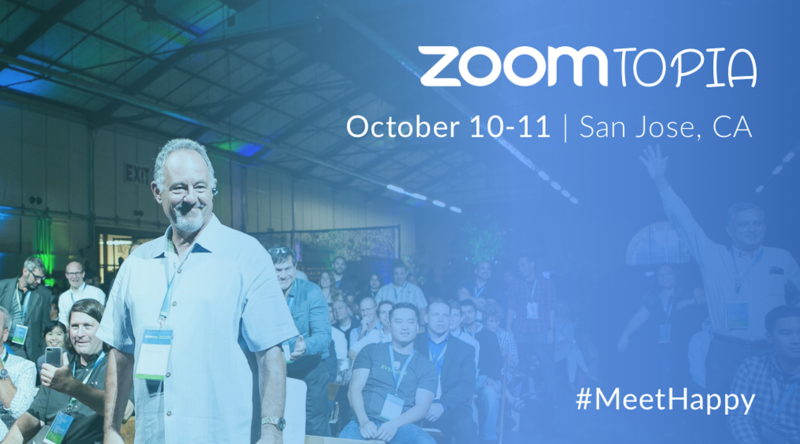 Don’t miss out on this happiness festival — it will help you build connections and learn the latest from Zoom and our industry, so you can return to work with practical and actionable information. Register now to reserve your spot at Zoomtopia 2018!